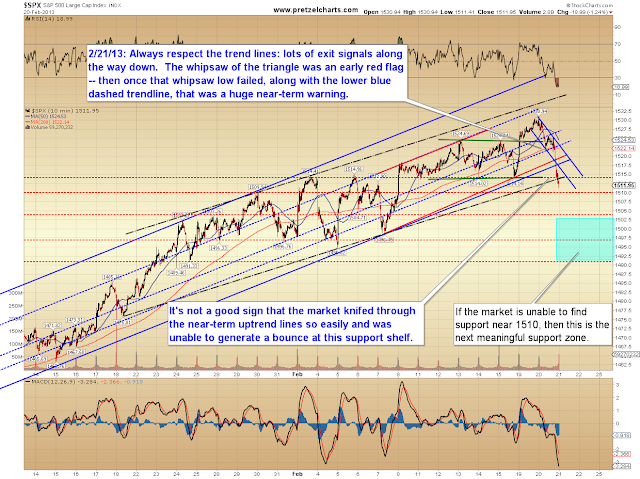 Pretzel Logic's Market Charts and Analysis: Is the Fed Serious, or Are They Simply Trying to Scare Speculators? 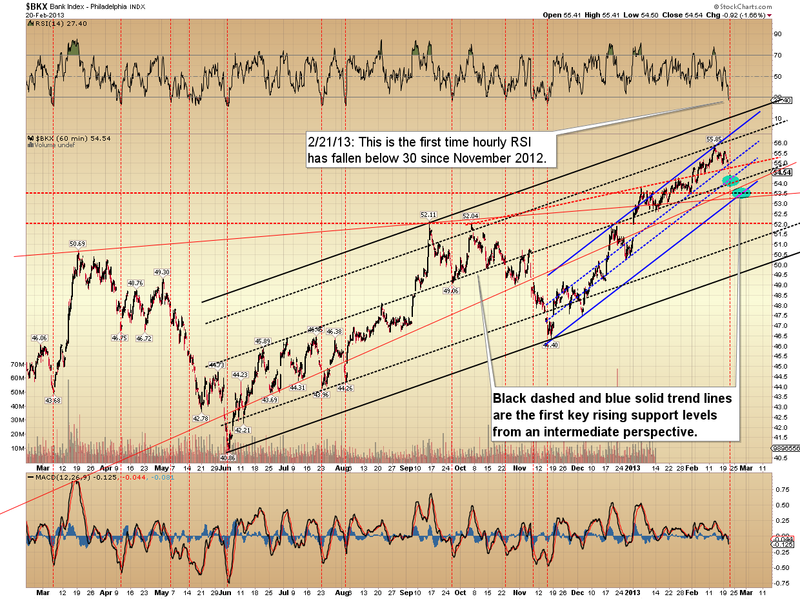 Is the Fed Serious, or Are They Simply Trying to Scare Speculators? Yesterday saw the release of the latest Fed minutes, and they revealed considerable dissention among committee members as to how long QE should continue, and whether or not it should be scaled back. There was even a proposal about whether to vary the pace of asset purchases on a meeting-by-meeting basis (talk about volatility!). The minutes seem to show a divided Fed who suddenly appears to be questioning its own policies, and the committee is presently less unified than we've seen over the prior few years. A review of the current program has been set for March -- so let's all Simonize our watches and mark our calendars for March 20, at which time Ben Bernanke will hold a press conference in the aftermath of the Fed's two-day meeting. The big question in my mind is whether this is "real" dissention, or simply the flip side of a coin we've seen from this Fed before. For the past several years, when we've been in-between QE programs, the public-relations strategy was clearly to "keep hope alive" for new QE programs. Of course we don't need to talk hope anymore, because now we have QE-Infinity, which (in its current form, anyway) is effectively a huge green light for bulls, screaming that the market is endlessly back-stopped. The message has been: "Buy risk assets at any price, and we'll make sure there's always liquidity flowing in to cover them." As a result, the present problem faced by the Fed is no longer "how do we keep hope alive?" Instead, the problem they face is how to gain control of the monster they've created, and how to put the brakes on rampant speculation. We've travelled 180 degrees, from "Let's talk up QE and keep the market hopeful," to: "Let's talk down QE and keep the market grounded." Which brings me back to my original question: Is this simply part of their PR strategy? 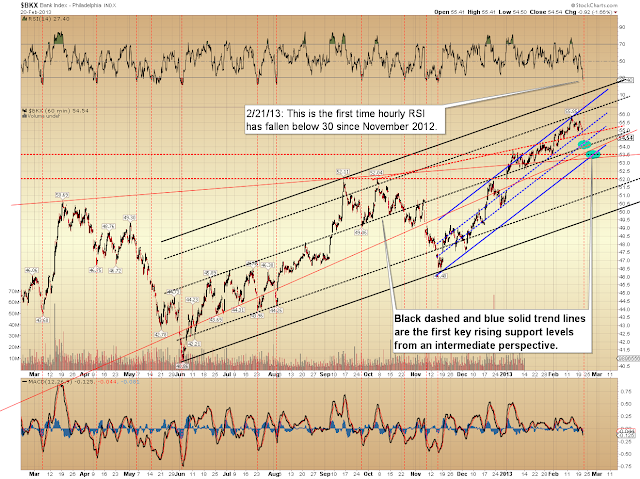 Or is the Fed genuinely having second thoughts? Obviously, I have no way of knowing, but I think it's a valid consideration. If they are having second thoughts, then that's a critical piece of information, and the market realizes that: hence the sell-off yesterday. If this is simply a PR strategy, then this is a temporary scare. This has largely been a Fed-driven rally since 2009. Without the Fed's "greater fool" purchasing power, it's unlikely risk assets would continue on their present upward course. This conclusion requires little in the way of speculation: every time a QE program has ended, the market has sold off (plus an angel gets its wings). Of course, we do need to remember that QE hasn't actually ended yet, and may not end anytime soon. All we have right now is the "threat" of QE maybe possibly sort of ending -- and again, I wonder if this isn't simply the Fed playing the game of "verbal monetary policy tightening" the way they used to play the same game in reverse, when Bernanke would run around making statements such as, "My finger is on the QE button!" Nevertheless, perception is often reality for the market, and with the release of yesterday's minutes, we do have a watershed event that clearly shifted at least the near-term sentiment. In fact, yesterday evening, a headline on Market Watch read: Dow Suffers Second Biggest Drop of 2013. To quote one of my favorite lines from the old TV series M.A.S.H. : "That's roughly comparable to being the finest ballerina in all of Galveston." While I make light of the temptation to jump all over yesterday's dip as the Eighth Sign of the Apocalypse, there are actually a couple issues we'll cover from a technical perspective which tell us bulls do need to stay on high alert here. The first revolves around that fact that the most recent breakout failed to reach the short-term upside targets (SPX fell about 4 points short). The near-term pattern whipsawed, which indicates that sellers came in earlier than they would normally be expected to -- and this is sometimes the type of behavior we see near larger turning points. The chart below shows the whipsaw of the green triangle pattern, and the failure of multiple up-sloping trend lines, along with the penetration into the support shelf in the 1514 zone. If support fails at 1509-1510 the odds are good we're headed to retest the area highlighted by the blue box. The odds presently favor a bounce in the next session or two (which could be viewed as a selling opportunity by the nimble), followed by new lows. I've largely ignored the bear counts since 2013 began, because up until now, I saw no reason to be bearish at all. It's rare that I have enough confidence in my preferred read of the market to essentially publish only one count, but it makes it much easier for people to follow along with the outlook when I'm saying "the two main options I see here are higher or higher." Now, however, responsibility and prudence dictate that it's time to give the bears a bit more airtime. As of yesterday, we cannot ignore the fact that we do have the potential of a completed ABC rally off the November lows. While I still prefer the more bullish outlook, which suggests a fourth wave correction and fifth wave rally still to come, there is another fact I can't ignore: every rally leg since October 2011 counts better as a corrective rally. And that means if this current rally follows that same pattern, it could be entirely complete. 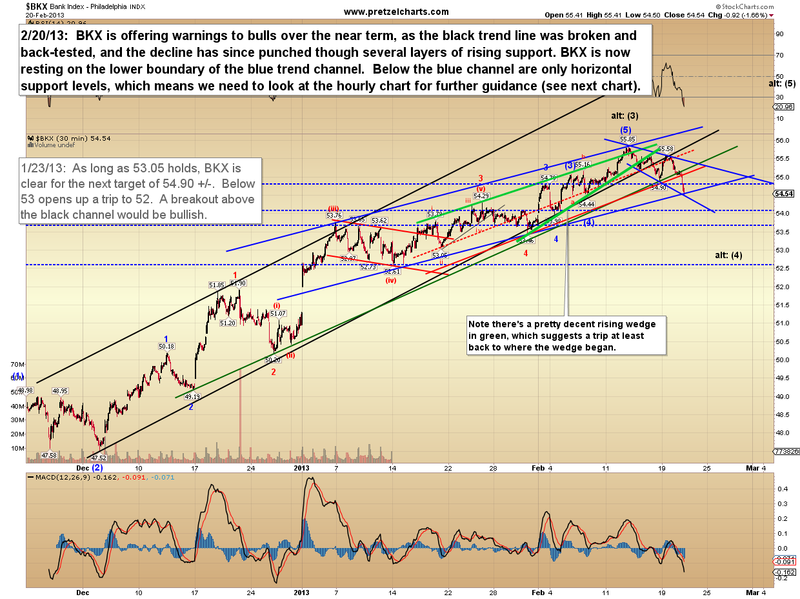 So: here we are with the market having now completed three clear advancing waves (shown below as the black ABC). That means we have to at least consider, and remain aware of, the possiblity that this is all she wrote for the intermediate term, and the market could embark on a much deeper correction than I'm currently anticipating. The daily chart (not shown) shows a bearish reversal bar, and down volume vs. up volume was strong yesterday -- and those warnings must be respected, since both typically argue for lower prices. Let's also take a look at the Philadelphia Bank Index (BKX), which I've been using as a leading indicator for a long time now. BKX actually warned of this turn in advance, when it made a new low last Friday. I noted the warning (before it happened) in Friday's update, but was uncertain how to interpret it immediately. Since the chart above runs as far back as Stockcharts will allow me to go with the 30-minute history, I've also drawn up an hourly chart highlighting some key longer-term support lines. In conclusion, while we've been on alert for a turn over the past week, I've been loath to front-run anything in this market. 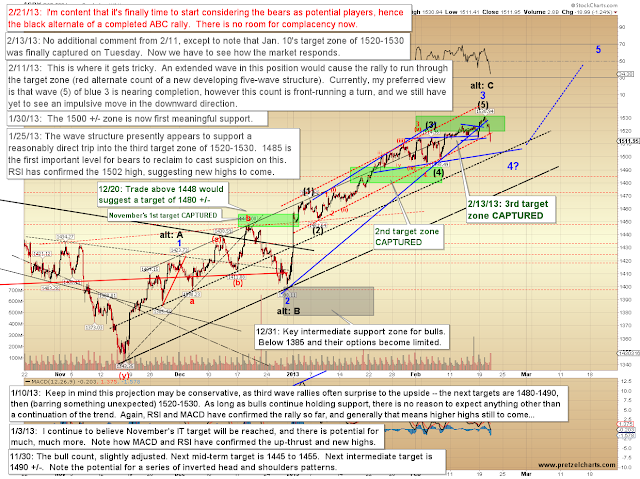 Yesterday was the first clear warning shot from the bears, and while there's nothing yet to indicate this is a turn of intermediate magnitude -- and I presently remain in favor of a bullish intermediate resolution -- I would urge readers who didn't previously take profits in the target zone to be extremely cautious at this time. Targets were reached, and "there's always the next trade." Trade safe. I don't think that the FED will change their course as long as inflation is low and unemployment remains high. 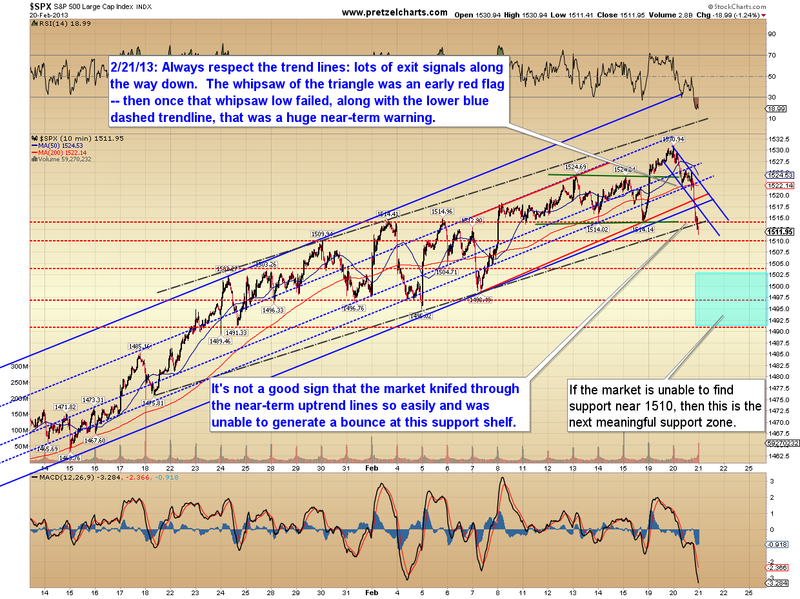 So I have to agree that we will probebly see the market reach higher still.